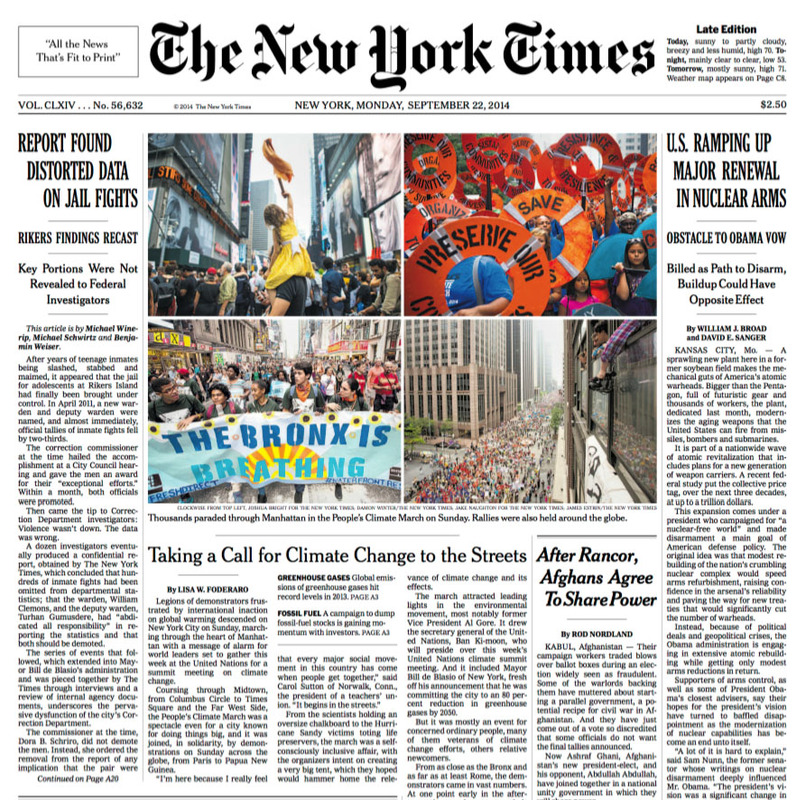 Residents of the South Bronx, a climate justice frontline community, were at the front of the NYC People’s Climate March on Sept. 21, 2014, and were featured on the front page of The New York Times on the day after. Bronx Climate Justice North was born and and is being bred in the Bronx. From our earliest origins as a small group of folks mobilizing the northwest corner of the borough for the NYC People’s Climate March on September 21, 2014, we’ve grown to over 100 members from every corner of the Bronx. Why work in the Bronx on climate change? Because we believe that acting locally will lead to big changes globally. But not only that. Many sections of the Bronx are legally designated as environmental justice communities. Decade upon decade of environmental injustice, redlining, school-to-prison pipelines, institutionalized food deserts, and more, have created communities that are demanding a better, more just future. We know that climate change is the physical manifestation, the physical embodiment, of economic and political systems, at all levels of government, that are unjust, inequitable, and ultimately, violent. We must be One Bronx, to solve our borough’s problems, to meet its opportunities, and to move it, from the bottom up, toward climate resilience, toward sustainability, toward justice of all kinds: environmental, racial, economic, political, social, and cultural. Our roots are here at home, as we work hand-in-hand with allies across New York City, the United States, and the world. Hunger: 36% of Bronx residents are “food insecure.” The USDA term “food insecurity” is defined as meaning that “consistent access to adequate food is limited by a lack of money and other resources at times during the year.” A significant number of Bronx parents, for example, sometimes forego meals to ensure that their school-age children do not go hungry. Income: 38% of residents in the South Bronx live below the U.S. poverty line, making it the poorest district in the nation. Population: The Bronx added nearly 240,000 residents between 1980 and 2012, an increase of 20%. Bronx families are choosing to remain in the borough and raise their families there; the borough is a magnet for immigrants seeking a new start. In the past 5 years, the number of children suffering from asthma in the Bronx has risen from one in five to one in four. In March, 2016, for the seventh year in a row, the Bronx received the LOWEST ratings for BOTH health factors and health outcomes, of New York’s 62 counties.